Here's an urban legend in the making...or Hogzilla II. Some one somewhere got bored...some kid or kids decided to have some fun. They took a picture of one of their buddies and did some "photoshop" work. And this is what they produced. The funny thing is people believe this...even news people, more than one. This is a really bad photoshop image. 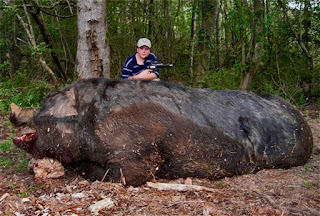 This is "The Hogzilla" and he wasn't shot by some 11 year old kid with a .50 caliber handgun running around in the woods. This is another example of me getting bored and exploring the blog world. Too many really bad blogs and some, few and far between, real gems. There are many. You just need to look. By the way, there was a story, about a year ago, on this "Hogzilla" thing on the NGC or the History Chanel. This is one of the pictures of that hog. Even then they thought the picture was faked. There was a huge hog unearthed but a bit smaller than claimed. Can't believe all you see...so whats new.